Beggar ticks, or hitchhikers, on pants legs are a sure prelude to fall. Two weeks ago, I described how the dollar leaf, Desmodium rotundifolium, was such a ground-hugger that its seeds were not likely to hitch rides on passersby. I was wrong. 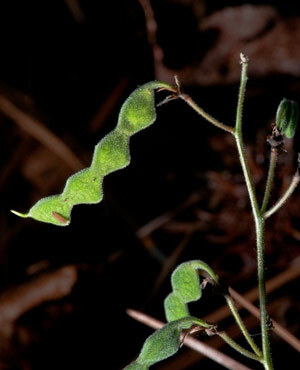 This week, Parker Chesson shared the latest of his seasonal-photo studies of this plant, with the observation that, as with all the other species of Desmodium, this velcro-lined little segmented bean does indeed reach up from the ground high enough to hitch a ride. Last week, I discovered lots of hitchhikers out in Merritt Pasture, now easily accessed via the new Chapel Hill Morgan Creek Trail. Three cheers for Chapel Hill for extending their creekside greenway system to provide us another destination for walking, jogging, biking with children and catching glimpses of the resident squirrel-chasing red-tailed hawks down beneath the James Taylor Bridge. A walk around Merritt Pasture is a joy from bottom to top. Two weeks ago, Robert Johnson’s Nature Notes workshop participants enjoyed observing the bluebirds that disappeared when the hawk arrived. In addition, they were appreciative that Chapel Hill carefully protects, from seasonal mowing, several large populations of common milkweed to accommodate annual visitations by monarch butterflies. 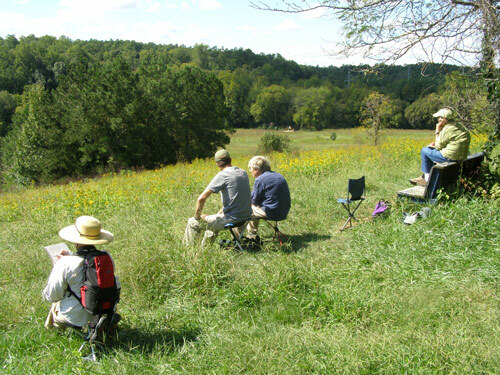 At the top of the meadow, near a bench thoughtfully placed beneath the big honey locust, Gleditsia triacanthos, class participants settled down to make quick sketches of the landscape. From the top, the rolling landscape seemed draped with a carpet of purple and yellow. 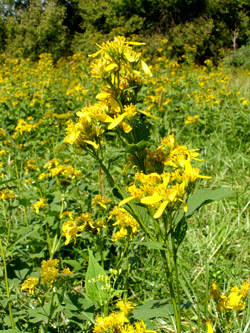 Throughout the sea of native purpletop grass, Tridens flavus, were scattered populations of two species of yellow flowering wingstem, Verbesina alternifolia and V. occidentalis. Though at the time the distant forest canopies were a cacophony of greens, it was noted that this is a prime spot to take in our leisurely progression of fall colors. The various species of trees are just now donning their autumn coats and they will, one by one, show off for several weeks to come. Make plans to enjoy several walks to catch the seasonal show. And take along a copy of Fall Color and Woodland Harvests by Ritchie Bell and Anne Lindsey – your closer look adventure will be more fun as you learn to identify trees by their characteristic colors. And capturing one’s walks out in nature with simple haiku lines is an easy way to preserve special moments. If you think you’re not a poet, you’re wrong. As I’ve encouraged before, everyone can haiku. The North Carolina Haiku Society is leading folks out into the N.C. Botanical Garden and forest trails for a special haiku workshop on Saturday, Oct. 22 (more info at 962-0522). You’ll discover that haikus are a quick and easy way to remember the special fall moments that are about to explode all around us. Whether or not you sketch or haiku, get outdoors to keep up with the fall. Email Ken Moore at flora@carrborocitizen.com. Find previous Ken Moore Citizen columns at The Annotated Flora (carrborocitizen.com/flora). Thanks for your observations. Virginia Callaghan and I live at 308 Winter Drive whose back yard is in line with the bench and honey locust. We would like to meet you some time soon and talk about this part of heaven we look out on every morning.